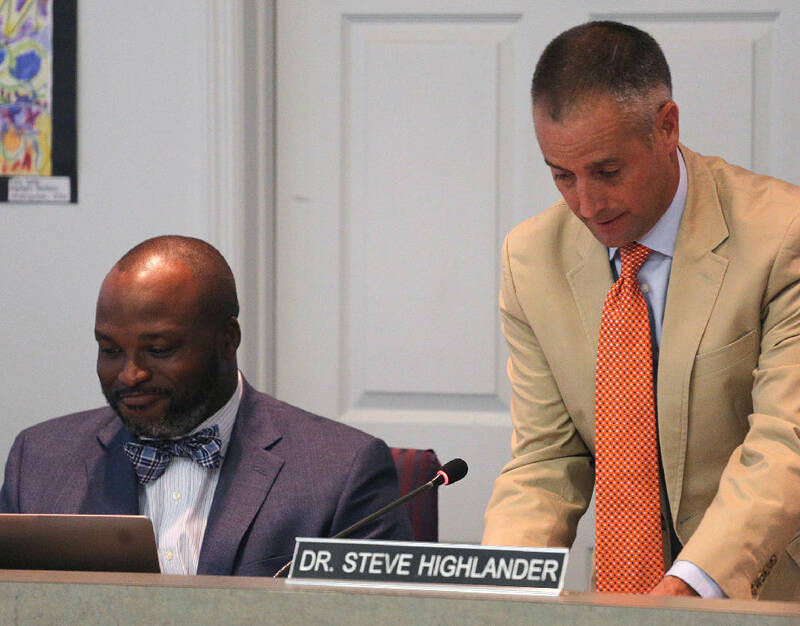 At right, Hamilton County School Board Chairman Joe Wingate changes seats with Dr. Steve Highlander following his appointment as the new chairman during the Hamilton County School Board meeting Thursday, September 20, 2018 at the Hamilton County Department of Education in Chattanooga, Tennessee. The school board names a new chairman and vice-chairman during the meeting. This story was updated Sept. 20, 2018, at 9:29 p.m. with more information. Despite a contentious debate sparked by its two newcomers, the Hamilton County Board of Education officially adopted Superintendent Bryan Johnson's five-year strategic plan Thursday night. The plan, Future Ready 2023, which Johnson first proposed in June, was unanimously approved after newly-elected board member Jenny Hill, of District 6, rescinded her motion to table the vote until the board's next meeting. Hill originally argued that she wanted more time to review the district's defining goals and to discuss it with her county commissioner, David Sharpe. "I think this is potentially one of the most important votes that I will make for the representative of District 6 and I think it is important for it to be the right vote," she said. "I think a critical part of a strategic plan is we've talked to families, the board has put input in, we've had a lot of input from the community but the other third wheel perhaps, I think we would benefit from a better relationship with our other elected leaders." View the draft of Superintendent Bryan Johnson's five-year strategic plan that was made public last week as part of the school board meeting's agenda. Tucker McClendon, of District 8, echoed Hill's thoughts, stating he did not know until the board meeting agenda was sent out last week that they would be voting on the plan Thursday. The rest of the board was pressed to approve the plan, thanks to Johnson's reassurances that the five-year strategic plan is a "living document." The plan quantifies targets for student achievement, while also focusing on facilities and transportation goals. "This is a great conversation. This is what learning organizations do," he said. "There is no issue at all from my context with tabling it. It's not meant to be divisive. It's something that hopefully the board will unanimously codify." School board attorney Scott Bennett noted that the plan was needed in order for the board to proceed with developing an evaluation tool for the superintendent. District 9 board member Steve Highlander noted the board had already fallen behind on that project. Hill noted several areas with which she had concerns, including open-ended measures for tackling opportunity gaps, the lack of mental health resources for students, and how facilities are evaluated in terms of aging portables and overcrowded classrooms. "These are questions that I feel matter to me as a taxpayer and me as a mom," she said. "We do have schools that are majority white and majority black. And that is real, and we know that is something that affects student achievement and that is not in this plan." McClendon acknowledged that he voted in favor of the plan out of respect for the work the board has previously done in its drafting, but added he plans to bring it back up for editing and future meetings. An easier vote earlier in the evening was the election of a new chairman. Joe Wingate, of District 7, was chosen as the new chairman in an 8-1 vote. Former chairman Steve Highlander, of District 9, served for two years, but along with the election of the two new school board members, his term was up. Tiffanie Robinson, of District 4, was also elected vice-chair in a 5-4 vote. Rhonda Thurman, of District 1, also was nominated. Thurman, Highlander, District 3's Joe Smith, and District 5's Karitsa Mosley Jones voted for Thurman. Mosley Jones was the only board member to vote against Wingate's nomination. District 7 representatives now chair both the school board and the Hamilton County Commission, with County Commissioner Sabrena Smedley's election to chairman earlier this month.